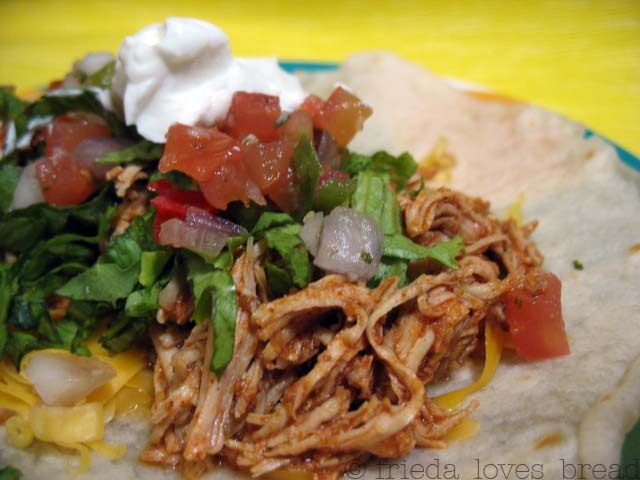 My friend introduced this crockpot recipe to me when I was first married. 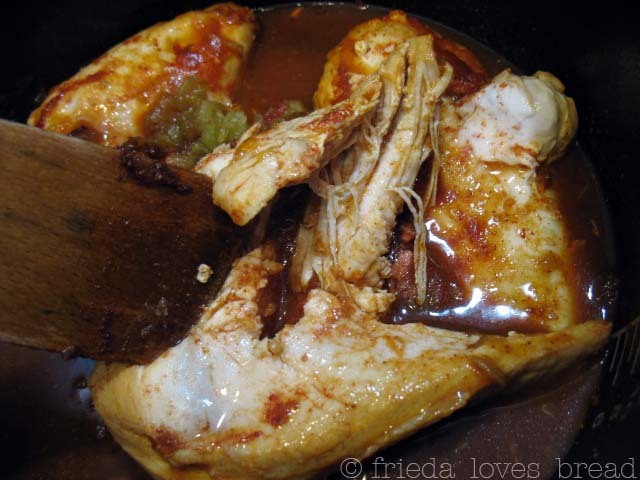 When I asked her for the recipe, she said it was in the crockpot recipe book: Mexican Turkey. This is turkey?? Turkey thighs, to be precise. I was surprised. It was really good. I wonder if I could use chicken? It worked great! I wonder if I could use this recipe in the pressure cooker? I used frozen chicken! Talk about a time saver! To save time, I use onion powder in place of chopped onion. 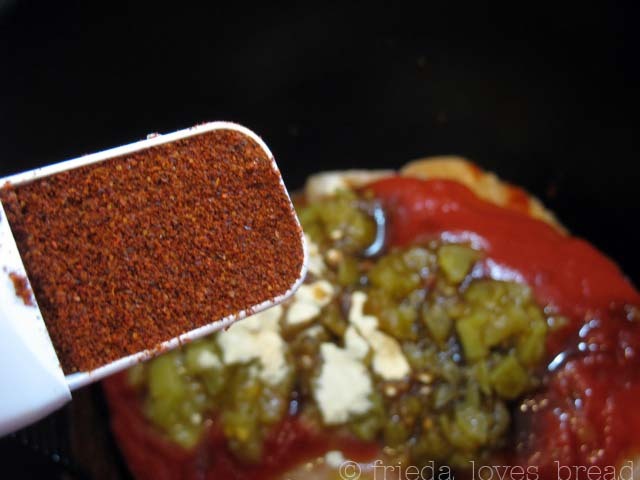 Garlic powder and to make it similar to a pork barbacoa, I added 1/4 c. light brown sugar. Put the pressure cooker lid on, set it on high, and the timer for 12 minutes. It takes about 10 minutes for it to come to full pressure, cooks for 12 minutes, then takes about 10 minutes for the pressure to release naturally on its own. 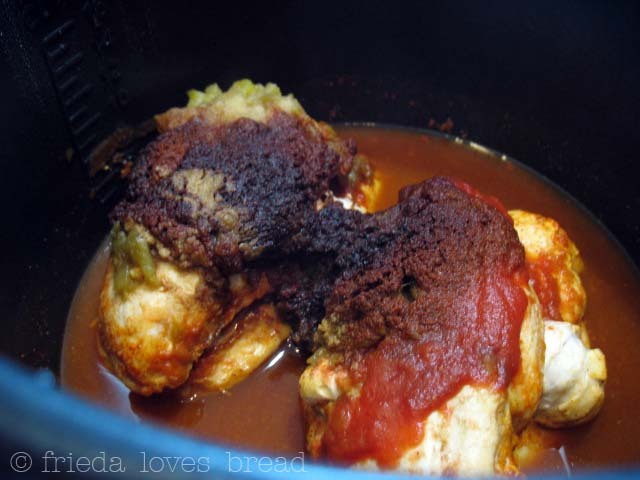 When I make this recipe in a crockpot, the chicken shreds easily right in the pot. This was not the case for the pressure cooker. I had to take the meat out and shred it with two forks. You can also use this TIP for FASTER shredding! I put the meat back into the sauce. It was only four o'clock and hubby wasn't going to be home for another hour. 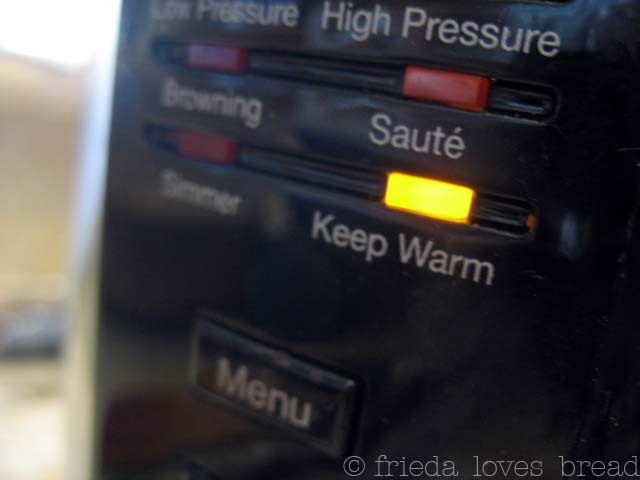 Try the Keep Warm setting on the pressure cooker. 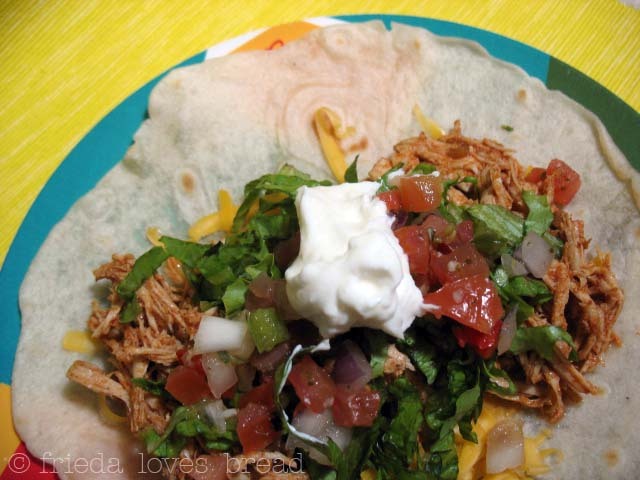 We enjoyed this shredded chicken on a homemade tortilla with salsa, cheese, lettuce and sour cream. What takes 10-12 hours in a slow cooker can be ready in 40 minutes or less? This recipe, which is literally a "dump meal." 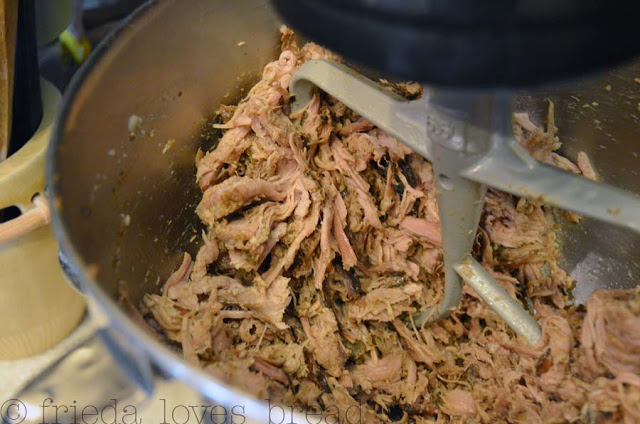 Dump all the ingredients into your pressure cooker and when it is finished, shred with forks or use your stand mixer with flat blade to quickly shred the meat in seconds. Serve with warm tortillas and all your favorite taco fixings. 1. 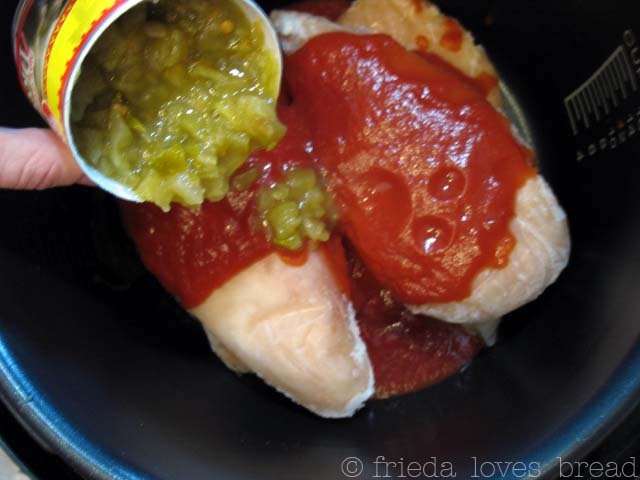 Place frozen chicken in the pressure cooker insert.2. Add next 7 ingredients on top.3. Close the pressure cooker and close the pressure valve.4. Select HIGH pressure for 10-12 minutes, choosing the longer time for larger chicken breasts.5. At the end of cooking time, allow for a 10 minute natural release.6. At the end of the 10 minute natural release, open the pressure valve to release any remaining pressure.7. 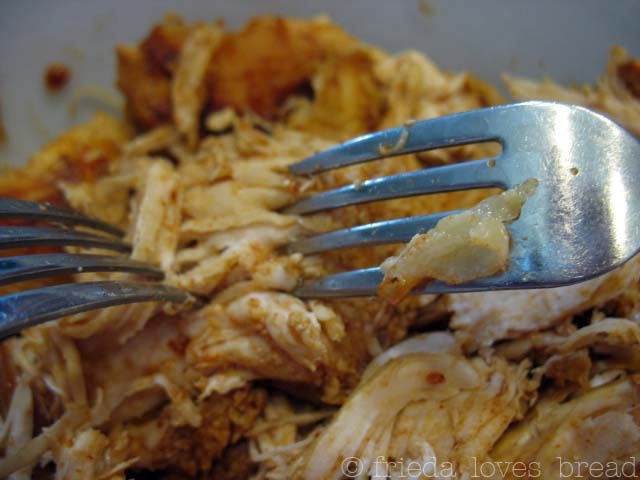 Open the cooker and shred the chicken with two forks. 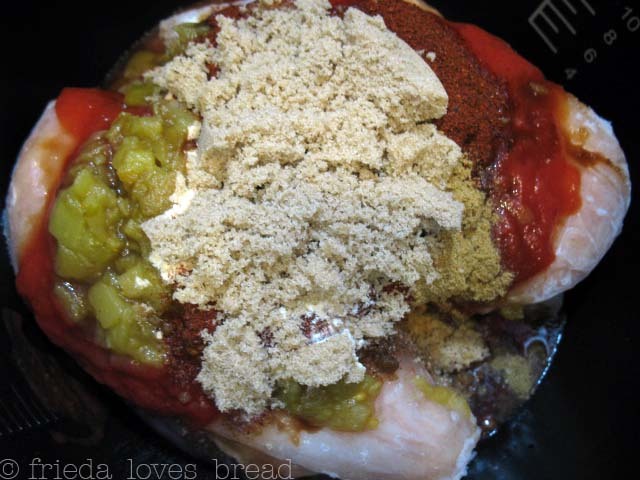 If using an electric mixer, remove the chicken and put in mixing bowl and shred. 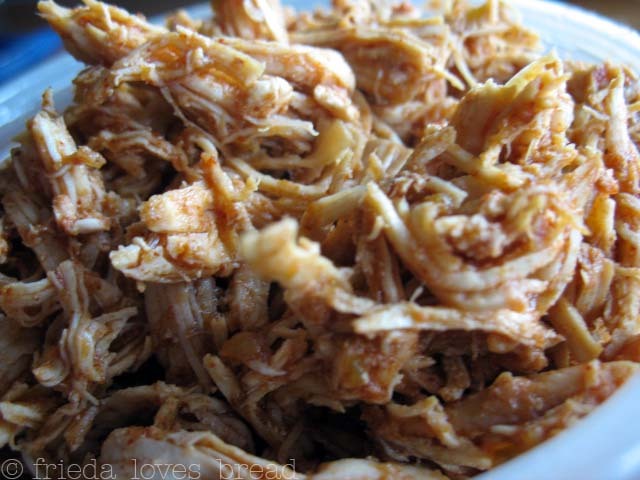 Return shredded chicken to the sauce. Using fresh boneless chicken? Reduce the cook time to 7-8 minutes with a 5 min natural pressure release. Serve hot, on warmed tortillas with desired toppings. This post may contain affiliate links. For more information please refer to our Disclosure Policy. Awesome! Is there an equation for time conversion? Looks great! Ann, I read through the pressure cooker manual (5-6 min for thawed chicken) and checked online for the time to cook frozen chicken (12 min). The recipe that Barbara used takes slightly longer as she had more chicken in hers. This recipe uses 2 lbs chicken, which was 4 pieces. Thanks for this recipe, I will try it out on my pressure cooker, love quick recipe verses 10-12 hours. Looks like a wonderful meal. Love the spices you used, especially the brown sugar to sweet it up. I haven't tired the warm setting, so it's nice to hear that it works great. Thanks for the link love. I love the bright colors of your pictures. Perfect for the fiesta food. Looks wonderful. My mouth is watering thinking about it. I cannot wait to try this out. Mmmmm. That looks so delicious! I don't have a pressure cooker, but have made a similar version in my crockpot. Can't beat 12 minutes of cooking time w/ a pressure cooker! Geeze. It cooks for 5 hours in my crock. Looks mouthwatering. Great summer meal. Shannon, go ahead, use your crockpot and let it do all the work. No sense slaving over a hot pot in the summer, right? Which pressure cooker did he purchase? I would like to get a new one. Im still using the one my mom gave me years ago! Oh, and pressure cookers are safer than they were years ago; they have safety features built in both models of the electric and stove top.